Kim-from Can You Hear Me? click here to visit the bookstore and view the book !!! 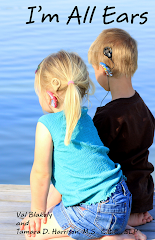 "Deafness Research Foundation (DRF) works to fund research to help those living with hearing loss and balance disorders, and on programs to raise awareness of potential causes to protect those at risk." Hope you enjoy!! Now I have to run purchase my copy!!! All proceeds go to charity. hey im part of DRF. thats great you did this... I was wondering where I can buy the book? its not on DRFS website. hey Dani, you should ask them that, seriously..they just found out about it like two days ago and are seeing it for the first time as well. But you should click over there on the contact us button on their site and tell them you want to see it on their site.